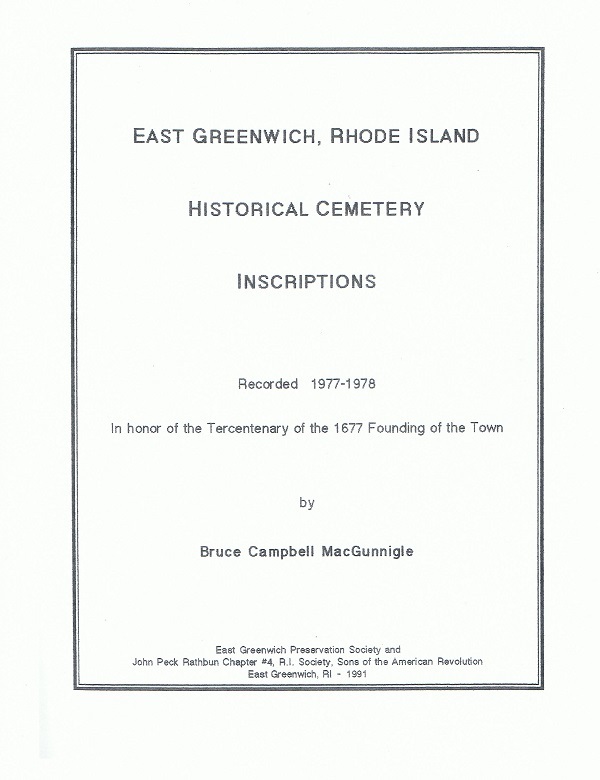 “East Greenwich, Rhode Island Historical Cemetery Inscriptions”, a book by Bruce Campbell MacGunnigle, was published by the East Greenwich Preservation Society in 1991 and printed by Minuteman Press of East Greenwich. 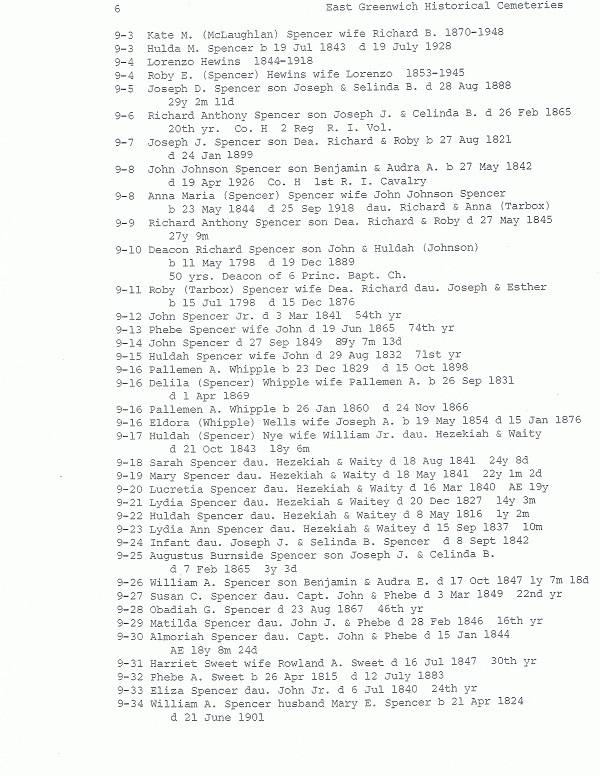 The John Peck Rathbun Chapter #4 of the R.I. Sons of the American Revolutions, P.O. Box 24, East Greenwich, Rhode Island 02818 supported this publication. 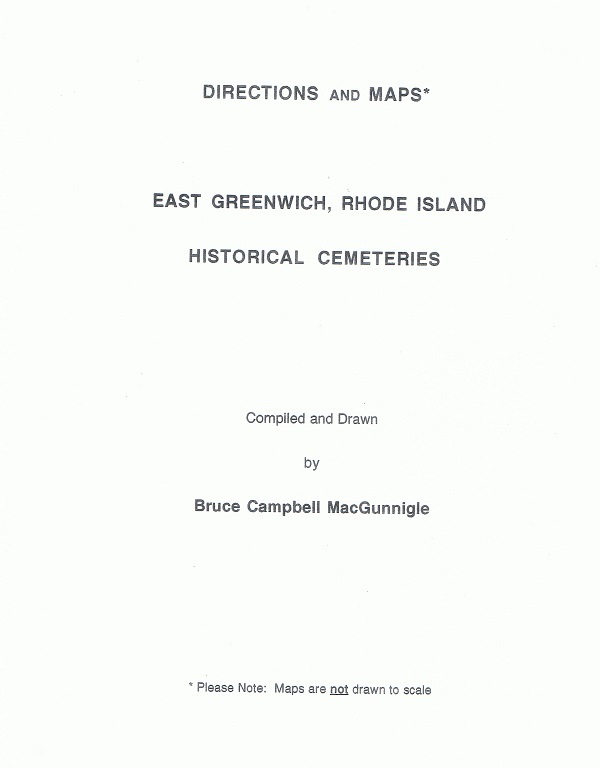 This book lists and gives diagrams of all the East Greenwich historical cemeteries and gives descriptions of the locations, the number of gravestones in each cemetery and other important information about the individual cemeteries. 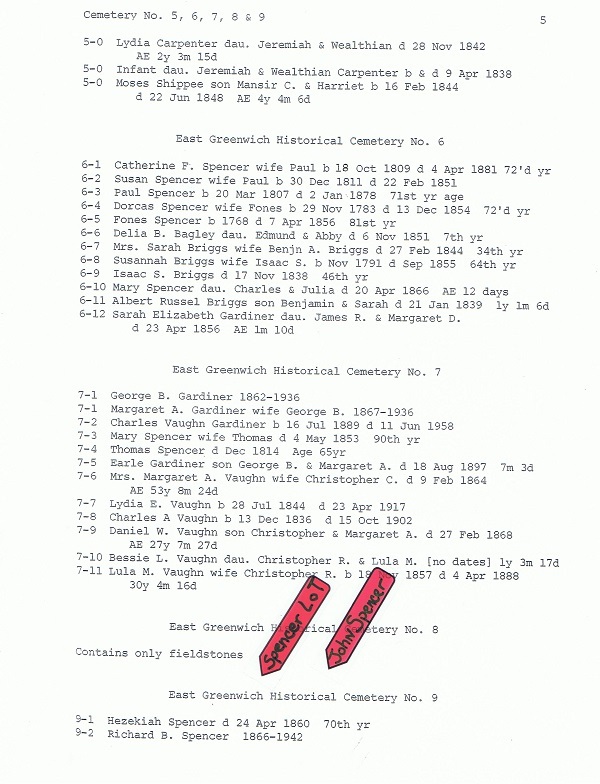 The book’s index is an alphabetical name index of all the people who have inscriptions on their headstones in the East Greenwich historical cemeteries. Audrey Mae (née Spencer) MacDonald, not knowing anything about the long history that went into researching and compiling this cemetery inscription book and fearful that her descendants would lose awareness of their ancestor’s cemetery, wrote about and diagrammed her own Spencer family historical cemetery (E.G. No.9). 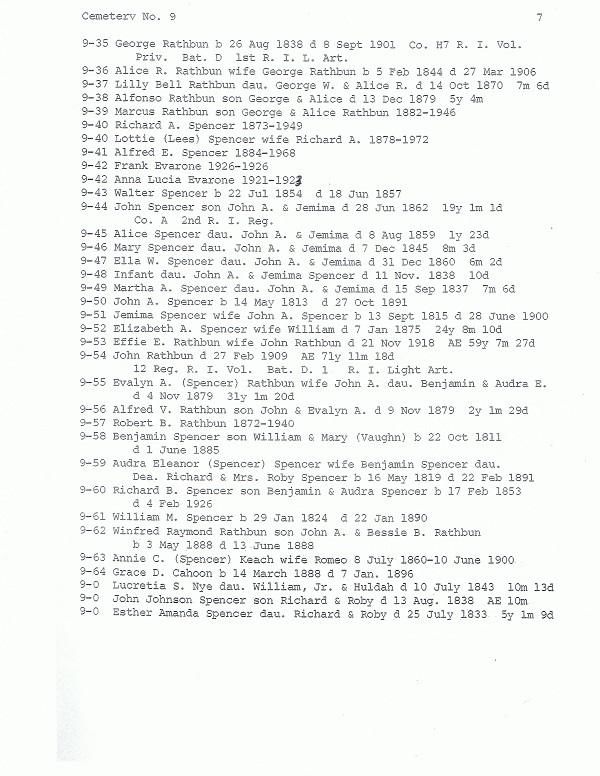 When Audrey Mae was in her late 70s, she gave copies in booklet form to all her descendants, as well as other Spencer relatives and friends to pass this on to their descendants. Therefore, there are now two numbering systems for the gravestones and inscriptions in the Spencer family cemetery, one by Bruce Campbell MacGunnigle and one by Audrey Mae (née Spencer) MacDonald. To avoid any confusion, this web site author has cross referenced Audrey Mae’s numbering system to Bruce MacGunnigle’s numbering system. In this web site, every person in the graveyard has a separate gravestone inscription page, headed by Audrey Mae’s gravestone numbering system. 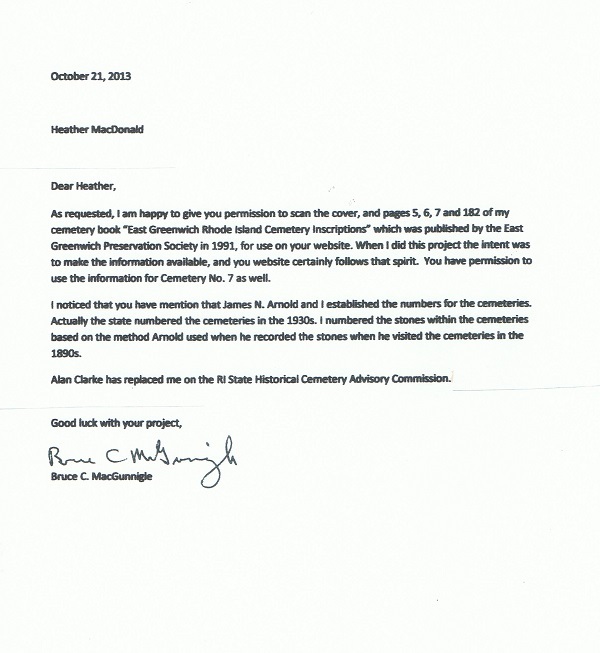 The name Bruce MacGunnigle with a number following his name will appear after each opening paragraph of Audrey Mae’s introductory statement for each individual in her family cemetery. The name Bruce MacGunnigle is a link to this explanatory page of the two numbering systems. Clicking that link brought the reader to this page. The number next to Bruce’s name is the number he–and James N. Arnold–assigned for each person or gravestone inscription. 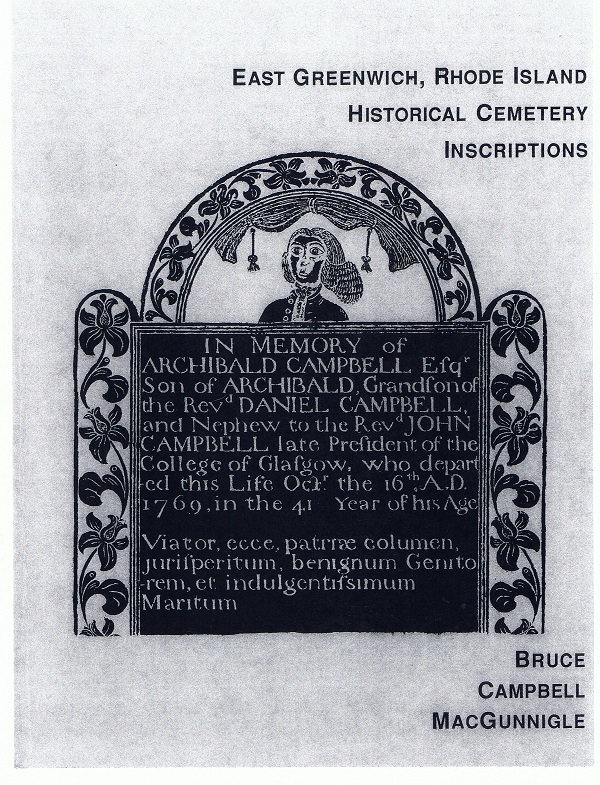 In the introduction to his book, MacGunnigle, a Certified Genealogist, states the reason behind his gravestone numbering system: “As I began the field work, I found it convenient to follow Arnold’s method of recording gravestones, starting at the north west corner of a cemetery, and working from north to south in each row. 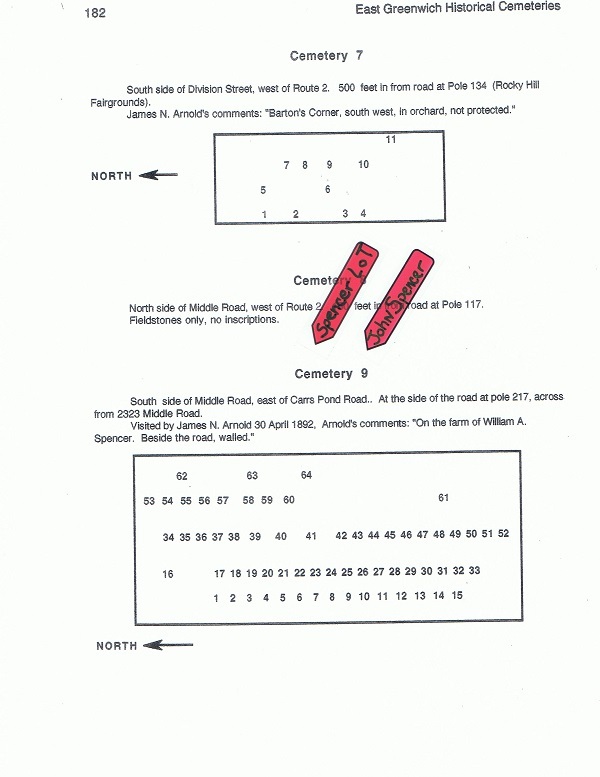 I assigned each stone a number as well, which allowed me to pinpoint the location of each of the stones within each cemetery.” James N. Arnold, in 1892, was the compiler of the multi-volume Vital Record of Rhode Island and he recorded many cemetery inscriptions. On the other hand, Audrey Mae began her numbering system at the southwest corner of the cemetery. She began with her great, great, great (3 times) grandparents, John and Huldah (née Johnson) Spencer as Gravestones No.1 and No. 2. The other gravestones in this cemetery are John’s and Huldah’s descendants and their descendants’ spouses. Correctly, all authors, Arnold, MacGunnigle and Audrey Mae, began their numbering system with the westernmost row of gravestones. Historically, all gravestone inscriptions faced west and all bodies were buried with their head to the west. Clicking the above <– (back arrow) just to the left of the domain name, www.spencerhistoricalcemetery.org, will take the reader back to Audrey Mae’s numbering system page.